This species is accepted, and its native range is Ivory Coast to W. Uganda. Africa: Guineo-Congolian forest., Lake Victoria regional mosaic; forest. Tree up to 15–25 m. high. Young branchlets glabrous to slightly pubescent. Leaves with petiole and rhachis eglandular, the latter 15–34 cm. long. Leaflets in 5–12 pairs, petiolulate, ovate-elliptic to oblong-elliptic, (3.5–)4–7(–8) cm. long, 2–3.2(–4.5) cm. wide, acute to obtuse or obtusely acuminate at apex, not or only slightly emarginate, ± pubescent on midrib, otherwise subglabrous to puberulous, but with pubescent margins at least when young. Bracts mostly fallen before the flowers open. Petals pink or white, about 1.5–2.5 cm. long, (0.8–)1–1.4 cm. wide. Stamens 9–10; filaments of 2–3 lower with S-bend near base. Pods cylindrical, 40–90 cm. long, 2–3 cm. in diameter, black, longitudinally and transversely partitioned within. Seeds brown, obovoid, compressed, 9–10 × 6 × 3–4 mm., transversely cracked. Steyaert in Fl. Congo Belge 3: 499, t. 35. Steyaert in Flore du Congo Belge et du Ruanda-Urundi, 3: 499 (1952). W.J. Eggeling, Indigenous Trees of the Uganda Protectorate, ed. 2: 59, photo. 7 (1952). Milne-Redh. in Hook., Ic. Pl., t. 3368 (1938). 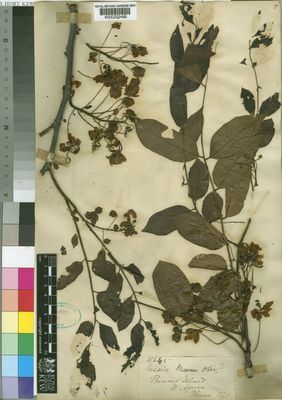 Oliv., Flora of Tropical Africa 2: 272 (1871).